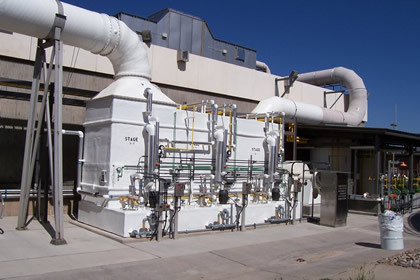 Pre-Packaged Modular Scrubber systems are offered as a single or multi-stage units. Each system is designed for the particular application and supplied with an integral liquid sump, liquid recycle pump (s), liquid recycle piping, valves, instruments and control panel. The prepackaged unit provides simple plug and play design features to make the installation as quick and efficient as possible. These type units are great for areas where installation space is a premium. Unique features include the ability to incorporate multi-chemistries in separate liquid sumps for the best multi-stage scrubber system benefits. 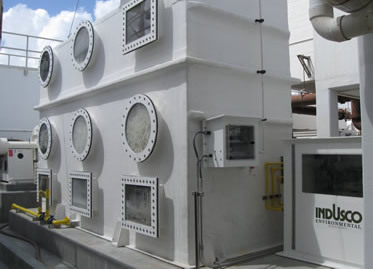 Packaged modular scrubbers can accommodate any of your scrubbing and absorption requirements.